2017 was a great year for video games, no matter your platform of choice. If you play on the PC you had the chance to experience numerous shooters, a couple of excellent survival horrors, some action games like NieR: Automata that wouldn’t see the light of day on the PC half a decade ago, the first full-fledged Forza Motorsport game, and even some cool RTS games showing that the platform is in its prime years. 2018 looks like it could be even better for PC gaming, with dozens of interesting titles on the horizon. Sure, some of them will disappoint, some will plain and simply flop, some will prove to be even better than expected, and there will surely be a couple of games coming out of nowhere and taking our hearts. But, let’s deal with titles we know, games that are announced for the current year, titles we think will fulfill their promise of giving us, gamers, lots of good times. Let’s begin. After the phenomenal Far Cry 3, which was one of the best shooter games ever, Ubisoft tried to make more money and rushed Far Cry 4, which was a sort of bland experience that looked like it had worse graphics than its predecessor, not to talk about the tedious campaign or the damn towers. The fifth installment of the long-running series will move the action to the U.S of A. Instead of battling dictators who, somehow, ended up with their own countries, you will try to destroy a madman religious cult located in the Hope Country, Montana. Sure, the location is fictional, but it looks good and sounds interesting. More explosions, more weapons, airplanes, monster trucks, big rigs, and dogs for hire are all new elements that should make Far Cry 5 feel new and fresh. And by the looks of it, the game should end up being at least above average when it comes to fun level. And that’s most important. The first two Metro games were a perfect mix of FPS action and eerie survival horror atmosphere. Playing as Artyom, a young lad living inside Moscow subway after a nuclear apocalypse wiped out most life on Earth, while at the same time giving birth to unimaginable horrors. An excellent atmosphere, superb graphics, and shooting mechanics that could be better were the main parts of the first two games. Exodus should bring even better visuals, levels that are noticeably bigger than in the first two games, and an exciting campaign where you will finally get out of the subway, hop on a train, leave Moscow, and go on a cross-country journey to look for survivors. Pillars of Eternity, along with its expansions, was one of the best titles of the recent isometric RPG revival wave. The game brought superb story filled with amazing locations, well-written characters, and fun quests. Three years after the original Obsidian is getting ready to release the sequel that should bring back a huge single player campaign, even more companions, better visuals, and a new world to explore. The game is set on an archipelago that should guarantee a huge diversity when it comes to locations. We should traverse over forests, deserts, dungeons, oceans, and there should be more than a couple of big towns to visit. The game looks highly interesting and if all goes according to plan Pillars of Eternity II: Deadfire should end up as one of the contenders for the Game of The Year. Kingdom Come: Deliverance is an RPG set in medieval times, but one that doesn’t feature magic or any kind of supernatural, fantasy, elements. The game should bring a pure, magic spells-free middle ages experience with superb combat, interesting quests, and lavish graphics. The game was originally planned for a 2016 release (if we are right), but development problems (read: lack of money and a small team) pushed it back for 2018. Kingdom Come: Deliverance looks amazing, its combat should be excellent, and there should be lots of areas to explore along with a couple of towns and a huge number of quests. If you crave for a fantasy-free medieval experience, wait for this one, it should deliver, and then some. PC should finally get its first Monster Hunter game! PC will get Monster Hunter: World after consoles. Oh well, but this shouldn’t be concerning because developers promised the game wouldn’t be a simple console port. It should bring better visuals, superb optimization, and a long story. 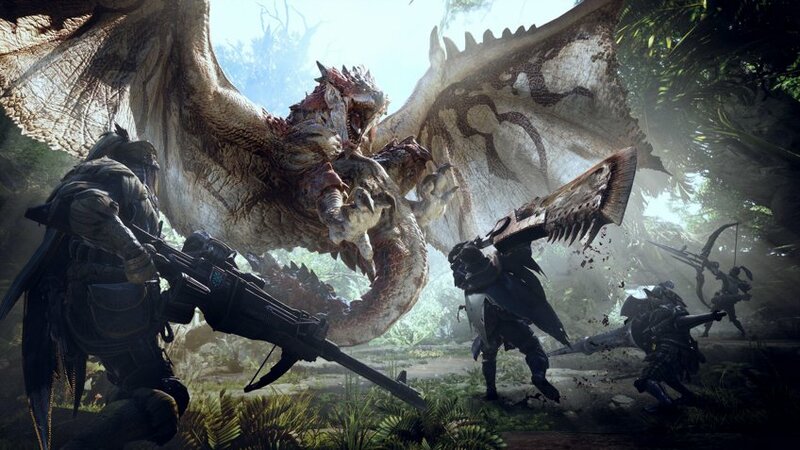 The game looks amazing, and if you ever wanted to hunt for giant creatures but couldn’t because you game on the PC, now it’s your chance to show the world just how good monster hunter you are. We haven’t got a good tennis game in how long, five years? But some of the guys who made Top Spin joined up and decided to create a new tennis game that should be out for the PS4 and PC sometime during this year. The game looks solid, it should lean more to a simulation than arcade, and it should include more than 30 pro tennis players. While graphics don’t look like the best in the world, the game is welcome because it is finally the time for PC players to get a new tennis title. And if Tennis World Tour (really, they could have come up with a slightly better name) delivers 2018 will end up being even better than expected. Another type of title we don’t see too often on the PC, Ace Combat 7 brings back aerial combat along with an intriguing story, all that packed inside a tasty and good-looking graphical package. The story should bring lots of different characters, a melodramatic plot, intense dogfights, and lots of cutscenes. There should be lots of different planes to fly, and lots of different weapons to use, so even if the story goes overboard, the combat should deliver. State of Decay was one of those sleeper hits that come in silence and then take over the world. The game featured an excellent depiction of a zombie-infested country, where groups of survivors must join forces in order to stay alive, and where even one can of beans is important. The sequel is way bigger, and it will introduce multiplayer to the series. Instead of one map, we will get three maps as big as the one we played on in the original. This should make survival even more exciting, but we personally think that single-player experience of the original was so intense and exciting that maybe it would be better if the sequel stayed in single player waters. Biomutant looks like a mix between Rachet and Clank, Monster Hunter, and some cool action RPG. The game’s main protagonist looks like it came from some cartoon and the game really looks different and original, filled with interesting creatures, lively environments, and lots of fast-paced combat. We think Biomutant will be one of the biggest surprises of 2018. It ditches the hyper-realistic aesthetics popular during the last couple of years and goes for the cartoonish looks that were prevalent during the golden age of gaming. It should be different, and it should be good. We sure hope it is. With the fall of THQ, Darksiders IP was in limbo for a couple of years until THQ Nordic bought the rights to the game. And it is so good that we will see another Darksiders game because the first two were so good. Playing as one of the Four Horseman during the apocalypse, trying to find out what’s happening while killing thousands of poor demons with your superpowers was so cool. The first two placed you in the boots of War and Death, and the third one will get you play as Fury, moving down demonic forces while trying to defeat the Seven Deadly Sins. We can’t wait for this one. If you want to visit Hell again after the excellent 2016’s Doom, watch out for Agony. The game is set in Hell, and it really looks dark and eerie, like the designers combined the works of Lovecraft and Stephen King, with lots of gore, sick visions, insane scenes, and twisted locations. The game looks rather disturbing and sick, and the trailer should show you in detail what you should expect. Agony will make you search for the queen of the underworld while battling demons and trying to survive in the world where every disturbed fantasy has come to life. Very promising. Call of Cthulhu: Dark Corners of the Earth was one of the most original horror experiences we ever witnessed. The game came out in 2006 and while it didn’t featured nice graphics or huge production values, it knew how to scare you. The new Call of Cthulhu game also looks like it can scare you, but it offers superb visuals along with excellent sounds. We don’t know much about the story, but it should start like a detective story that quickly goes south. You will have sanity system, lots of investigation, and we hope at least a couple of guns. Another Tropico game is always good. Everyone likes to sit comfortably in their chair and play the role of the El Presidente who has its own banana republic in which he is the Great Leader who everyone likes. Until guerrilla forces stage a revolution. Tropico games were always fun, and every single game was a quality experience so we can’t wait for this one. We hope the excellent music will again play while you try to make your economy float above water, and that leading your republic will once again be filled with humor and scenes of intense laughs. The first two GTR games were excellent driving simulators, and we are certain that GTR 3 will continue the tradition. The game is developed by SimBin UK, a new studio with a recognizable name made out of veteran developers, and the game should come with a solid selection of tracks and cars. GTR 3 looks amazing thanks to the Unreal 4 engine, and we hope the driving will be as good as visuals. GTR games were always cherished because of their superb physics and excellent multiplayer so we think this one will be one of the best racing games of 2018. Vampyr is an RPG set in the early 20th century London, in which a plague decimates the city’s population with you being the only hope for creating a cure. Because you are a doctor, and a vampire. This looks like a great combination, especially because the game should bring a huge world to explore and lots of choices to make. You can feed on everyone, and you can decide will you feed only when absolutely needed or every hour. You can turn civilians, and you can kill them all if you want to. We can’t wait for this one because it looks like one of the more original RPG cames to come out in recent years. System Shock was, and still is, one of the best horror action games of all times. The game introduced a whole new genre and was the main source of inspiration for games like Deus Ex, Bioshock, and Prey (2017). Now, some of the people who were a part of the original team that brought us System Shock, are working on a reboot. Instead of just making the same game with modern graphics, the team will introduce new and redesigned levels, new equipment, new gameplay elements, and will make the game more fitting to the modern day and age. We can’t wait for this one. Developed by Crytek, Hunt Showdown brings stunning visuals along with a combination of a co-op survival horror, hunt gameplay we saw in Evolve, and permadeath combat. You play as a member of one two-man team that is hunting for demons. And, like the demons aren’t enough, you and your mate should look out for four other teams with the same agenda. Yup, you can be killed by demons or by other teams, and if you happen to kill a demon and take the loot, you must escape the map alive, while other teams hunt for you instead of demons. Looks interesting and it could bring something new to the world of FPS multiplayer games. There are lots more interesting games that will launch during 2018, but we had to limit our list. Rest assured, you will see much more quality games in 2018 than you think because with this list, we just scratched the surface.